I’m a fan of Pixar’s movies. They historically have been lively, inventive, and heartwarming, except for Brave, which was more Disney than Pixar, IMHO. Pixar movies are the antidote I feed my little multi-racial kid for her constant dose of Disney Princess crack. Now, I don’t give her Disney Princess crack on purpose. She gets it from the air, as far as I can tell. We don’t have cable, nor do we own any of the movies, but she could name all of the White Disney princesses and identify them on sight by dress color by the time she was 3. I caved and bought The Princess and the Frog just to put a little pepper into that pile of salt. Princesses, mostly White but sometimes Black, are so much the basic fodder of childhood fed to girls, without any interrogation of the stereotypes that go along with it, that a movie with a princess in it, regardless of race, generally doesn’t get my Stamp of Sufficient Diversity(™). With the unavoidableness of the White Princess ideal, I watch Pixar movies with my daughter because beyond knowing that the one in the yellow dress is Belle, she should also know that toys live, robots love, and Samuel L. Jackson is as funny an Iceman knockoff as anyone ever could be. It is with all of this in mind that we went to see Inside Out, the latest, greatest from the imagination machine in Emeryville, California. In their latest offering, Pixar brings us three female leads, none of whom are princesses: the protagonist pre-teen Riley (voiced by Kaitlyn Dias), and her primary emotions, Joy (Amy Poehler) and Sadness (Phyllis Smith, my personal favorite). 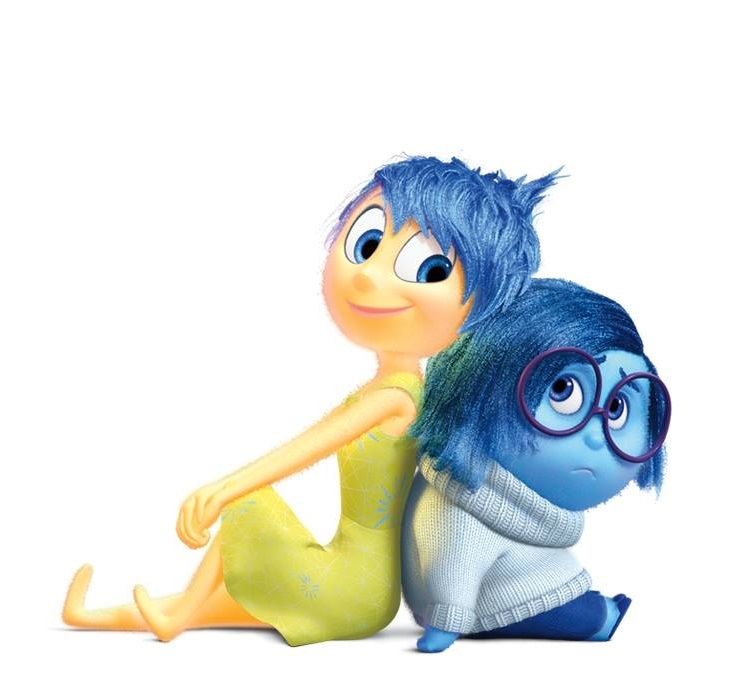 The primary conflict is between the relentlessly bubbly, Joy and the downer, Sadness. Together they get lost deep in Riley’s mind following the emotional mess that is the cross-country move and integration into a new school. This leaves Fear, Disgust, and Anger in charge of Riley’s behavior. Sounds like my middle school years, for sure. Do not leave these three in charge. Bad things happen. The whole movie functions as an extended allegory for how the mind works. Allegory isn’t my favorite storytelling technique. It can feel forced, the comparisons stretched to the point where what each item is supposed to symbolize is lost. For example, there’s a whole “dream boy” character in the movie that I’m not sure what he was there for. But there are also plenty of subtle jokes about the Train of Thought, an actual train that runs between Riley’s conscious mind and her memories, or the Dream Theater, where she synthesizes all of the activities of her day. Through it all, the center is the great pairing of Joy and Sadness as they try to work together to bring some balance to Riley’s emotional life. Should you go see it? If you like Pixar movies, you’ll like this one. It is beautifully rendered and rings true to a child’s emotional life, and mine. It might be too emotional for some kids, a friend’s 6-year-old had to leave the showing early because he was in hysterics over one of the scarier scenes, but much of the emotionally heavy stuff may go over your kid’s head — I’d just exercise caution if you’ve got an sensitive little one. Speaking of emotional, yes, there is the usual Pixar pre-movie short. It is called Lava and if you’re not crying by the end of it you should have yourself checked — you might be a robot. 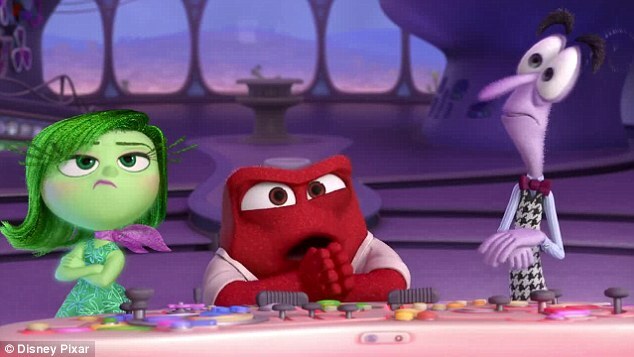 Inside Out made more money in it’s opening weekend than any other movie based on an original idea. Proving that plenty of movie goers know what I know — when a summer full of remakes and sequels has you feeling cynical, an hour and a half with a Pixar movie can make it all better. Plus, no princesses. I went to see this movie. I loved this movie. I would buy this movie. Frozen for 2013, Inside Out for 2015. Not too sure what I’d pick for 2014, because I was still obsessing over Frozen, but that’s something I’ll need to sort out.